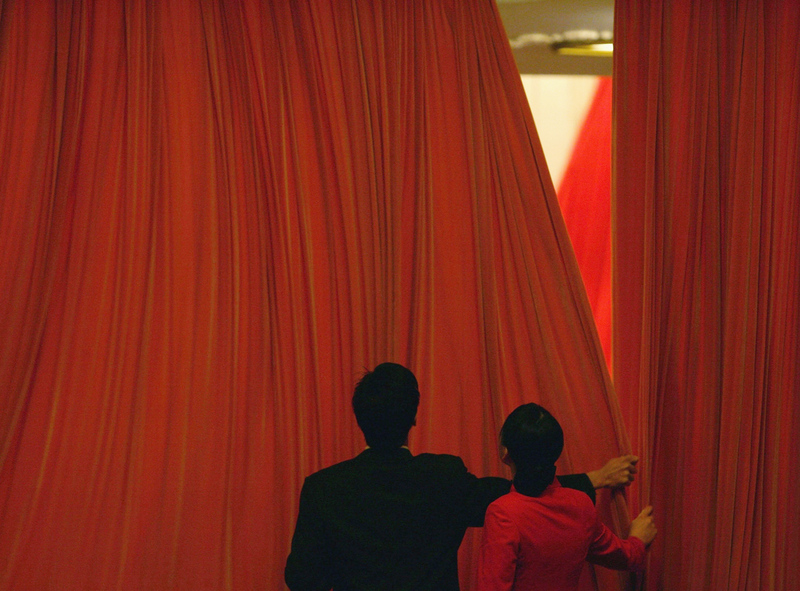 Attendants draw curtains closed during the closing ceremony of the National People’s Congress (NPC) at the Great Hall of the People in Beijing, March 14, 2005. What does this mean for higher education in China? In a speech last year, Xi Jinping, ironically mouthing precisely the clichéd officialese mocked by Xu, called for Chinese science and technology scholars to “grasp the main trends, seize opportunities, face problems squarely, and rise to challenges,” and to “aim for the frontiers of science and technology, lead the direction of its development, shoulder the heavy responsibilities bestowed by history, and be vanguards in innovation in the new era.” Can China be a leader in any field when the state insists on ideological conformity? Certainly it is not impossible that China could go a long way in some fields while retaining its punitive regime of thought control. Equally clear, however, is that when push comes to shove and the Party-state is forced to choose, it will always come down on the side of control, and that is as true at universities as it is anywhere else. This must be kept in mind at all times when thinking about higher education in China or matters such as university rankings. The Times Higher Education World University Rankings put Tsinghua at number 22. Do these rankings take academic freedom into account? While it might be thought that in fields such as STEM (Tsinghua’s main claim to fame) political controls would be much less constricting, let us not forget that the structure that makes it possible for Party secretaries to control academics for political purposes also make it possible for them to control academics for any other purpose—vanity, personal vendettas, sexual harassment, corruption, getting c0-authorships, or plagiarizing or blocking plagiarism investigations, to name a few. All of those corrupt scholarship in STEM fields as much as anywhere else. The punitive decision to relieve Professor Xu Zhangrun of his duties at Tsinghua, bar him from teaching, and prohibit him from taking on new graduate students shows that even a deferential scholar like Xu can lose his employee benefits and prestigious titles if he inquires into political rights or proposes peaceful incremental reform to the highest authorities in China. Xu thought my attitude towards the Chinese Communist Party and the government to be radical, aggressive, and defiant, and considered his own views to be more rational and constructive. He argued with me about these issues about 10 years ago during a conference that focused on China’s reform and institutional change. Like many scholars inside and outside China, Xu tends to believe that more moderate, practical suggestions—those likely more favorable to the ruling party and the government—may work better than radical and idealistic proposals. Even now, some still believe China might have started down the road of constitutional democracy if the student leaders at Tiananmen Square had withdrawn before June 1989, allowing government reformers like Zhao Ziyang and some of his like-minded colleagues to promote political change after successfully reforming the economy. Those ideas are naïve. Regarding the rulers as equal partners and reasonable negotiators is as unrealistic as asking a tiger for its hide. The Nobel Prize winner and peaceful critic Liu Xiaobo faced a similar struggle under this draconian political climate; past experience has taught serious critics and dissidents to not be optimistic when they must rely on the mercy and rationality of China’s powerful rulers. After several crackdowns and Xi’s having become a dictator, some scholars were fired and forced into exile, including myself, Qiao Mu, and Wu Zuolai. Some, like Xu Youyu and Zhou Xiaozheng, chose to leave China and settle in the United States after they retired. Few scholars dare challenge the regime in public and remain in China. Xu and Zheng Yefu are rare exceptions. In February 2016, the well-known real estate developer Ren Zhiqiang, challenged Xi on his widely read microblog, with about 37 million followers. In response, the government shut down his social media accounts and the Party suspended him. This happened despite his strong ties with Wang Qishan, one of the seven most powerful leaders in China and the current vice president. Xi’s dictatorship has blocked off all channels for critical intellectuals to submit recommendations. Instead, he encourages absolute obedience from flattering eunuchs. Now people say, unleash Xi. Don’t stop him and try to save the Party-state. Instead, let him die with it—as soon as possible. A few days ago, I received the news that Xu Zhangrun had been removed from his academic teaching and research responsibilities at Tsinghua University Law School pending further investigation and possible punishment. At first, and even now, I wonder whether this news is true. Maybe what has happened is something different, or maybe the pending investigation will never eventuate. We don’t quite know for sure. But increasingly it appears that this terrible news is fact. As I reflect on what to write, I feel that the human scale is easily lost. My other colleagues in this conversation very ably focus on broader issues including implications for academic freedom, which frees me from this responsibility. Of Zhangrun’s many old friends, I happen to be one who has been invited to say something here. I am reluctant to objectify him and his work by seeking to describe or summarize, except to say that his work speaks for his values, and his persistence in speaking and writing demonstrates his strong moral compass and unwillingness to abandon principle. But, no matter how virtuous, principled, or brave, being punished transforms a private life into a public one and makes Zhangrun somehow public property open for analysis and scrutiny. Maybe our critical attention has been diverted from the decision and decision-maker because they are everywhere and nowhere. Who made the initial complaint? What were their motivations; was it because they believed his words and works to be wrong in some way, or was it because there was some advantage to be had in terms of institutional rivalry, point scoring, or just ingratiating oneself on the altar of political correctness? We know, and many have experienced, the pettiness that follows campaigns of ideological correctness. So we might ask, why did anyone take this complaint seriously? What were the factors that compelled action? Was it more about the bad luck of timing, an unlucky confluence of people and politics? Was it just that Zhangrun happened to be in view when a message was to be sent? Our questions batter against shadows. None of these people will be called to account in the way Xu Zhangrun is. How, then, to retrieve the human dimension of this travesty? Zhangrun, I don’t want to speak about you, but to you. So, if you get to read this, please know that your many friends love, respect, and value you in exactly the same way today as we did last month and last year and will continue to do so. It is hardly news that the Chinese Communist Party (C.C.P.) infringes on academic freedom and freedom of expression. During the Cultural Revolution, millions of intellectuals were killed, driven to suicide, or detained in labor camps. After that, the Party seemed to attempt to restore its relationship with intellectuals, but from time to time it has failed to hide its hostility to them. The C.C.P. has never hesitated to punish those who deviate from the Party line by silencing, humiliating, and throwing them into prison. The C.C.P. has an ever-increasing list of forbidden zones: the Tiananmen massacre, Falun Gong, Uighurs, Tibet, underground churches, political dissidents, human rights activists, corruption of top leaders, torture, organ transplants, and so forth. Intellectuals who intrude into the forbidden zones, or anger the Party with any research or writings, pay a heavy price, such as dismissal, conviction, detention, disappearance, and torture. I began to teach at China University of Political Science and Law in 2003. While I taught, I worked as a human rights lawyer. Because my work treaded on the C.C.P.’s forbidden zones, I never was promoted, received a research grant, or was able to publish books. After I signed Charter 08, I was banned from teaching for the first time. In 2009, I was suspended again for participating in a conference in Beijing to commemorate the 20th anniversary of the Tiananmen massacre. Then, I was abducted by the secret police three times, before eventually being fired in September 2014. The last time I was allowed to teach in China was in 2012, right before Xi Jinping came to power. Since then, scholars with critical views have become more susceptible to dismissal and detention. The 2013 Party directive known as “Document 9” exhorts Party members to “conscientiously strengthen management of the ideological battlefield” by guarding against universal values, freedom of the press, civil rights, Party-elite capitalism, and judicial independence. Tightening restrictions on universities is only the tip of the iceberg of Xi Jinping’s repression of civil society. All the forces in favor of an open society, including rights lawyers, dissidents, the Internet, journalists, NGOs, and underground churches, have been severely suppressed. Xi’s efforts to build a cult of personality, establish a social credit system, adopt surveillance technology, and wage war against religion are coalescing into a new “high-tech totalitarianism.” So it’s no surprise that Xu was stifled after he courageously criticized Xi and his perverse policies. The C.C.P.’s regime is essentially anti-intellectual. Whenever it senses a political, financial, or ideological crisis, it launches a war on thought, reproducing and updating its 1957 purge of intellectuals. We are in the midst of such a purge now. In a recent report, the Uyghur Human Rights Project (UHRP) identified 386 Uighur intellectuals disappeared or detained in internment camps or prisons, six of whom died in custody or soon after their release. The Party’s brainwashing, censorship, and propaganda have been effective. If they continue, it will become increasingly difficult to cultivate a spirit of freedom in China. While it might be tempting to interpret Xu Zhangrun’s suspension and potential firing as part of an anti-liberal crackdown, that assessment grossly understates the extent of the problem. Foreign media reports may tend to focus more attention on liberal-leaning scholars, but the recent escalation in political control of the academy spans the entire ideological spectrum and affects nearly all social scientists and humanities scholars working on the mainland. Over the past several months, a number of prominent leftist scholars (the Chinese “right” is liberal-leaning, whereas the “left” is often more conservative and pro-government), including Feng Xiang, Xu’s Tsinghua Law School colleague, have also had their writing banned due to politically sensitive content, ranging from specific hot-button issues like worker compensation to general theoretical debates on the nature of socialism or nationalism. The chill’s reach is universal. The frequently used term “crackdown,” moreover, understates the scope of the current assault on intellectual autonomy: “crackdown” implies banning certain topics and viewpoints, but the current campaign is at least equally committed to reinforcing and incentivizing the kinds of so-called “research” China’s leaders prefer. In the legal academy, the past few years have seen concerted state sponsorship of politically desirable research topics. Grants were generously doled out, research centers established in every major law school, and related papers given privileged access to prestigious journals. Scholars flocked to these topics in droves. Generally speaking, bureaucratic and administrative entities now play a much more robust and formal role in academic life than they did as recently as 2012, not merely steering scholars away from undesirable issues, but also steering them towards topics and positions that curry favor from political superiors. The institutional environment junior and mid-career scholars now face—one of near-constant promotion review and perpetual pressure to publish in “top,” state-funded journals—dramatically amplifies the effectiveness of such steering. The assault on academic autonomy therefore includes both carrots and sticks .The stick draws most of the criticism, perhaps justifiably, but the long-term erosion caused by the carrot is at least as dangerous: negative restrictions can be imposed or lifted at relatively short notice, but if academics begin to lose their sense of positive autonomy and purpose—of what truly and genuinely interests them as scholars—then the current miasma may very well become permanent. What the current regime is trying to accomplish in terms of academic control goes far beyond even Mao-era precedents: Mao’s relationship with academia was, especially in his later years, predominantly negative. He had relatively little interest in coopting academic energy for political use, and, ironically, his sweeping hostility actually helped preserve the intellectual autonomy and solidarity of the scholarly community, which swiftly recovered its vibrancy after 1978. By comparison, the current regime’s approach is much more institutionalized, implemented methodically through administrative and legal activity, rather than through bursts of frenetic political campaigning. Despite its more measured pace—or, rather, because of that—I fear that it will leave far deeper wounds in the Chinese intellectual psyche. Unlike many colleagues in the China field, I do not know Professor Xu Zhangrun of Beijing’s Tsinghua University Law School personally. Yet I have admired him and his publications from afar. The New York Times has a saddening report by Chris Buckley confirming Xu’s suspension from both teaching and research and his subjection to a continuing investigation and a drastic salary cut. This comes as no surprise. The surprising thing is how long it has taken for the Sword of Damocles to fall on this great man. Xu was in Japan last year when his epic essay on the Xi Jinping regime’s repression was published and made available in English. It was a valuable and courageous challenge to an increasingly brutal dictatorship, one that obviously placed him in personal jeopardy if he returned to China. Yet he did return, despite the advice of colleagues and friends to remain safely abroad. When I learned of his intention to return, although I know him only through his work, I took the liberty of sending an email urging him to reconsider, since it seemed clear that he would not be allowed to continue his writing and teaching in the current situation and might well suffer more severe sanctions that would not only deny his personal security but also deprive the rest of us of his wit and wisdom. Unfortunately, for whatever reasons, he was determined to go home. There have been many precedents, of course, even during the milder previous administration of Hu Jintao. The case I know best is that of the dynamic constitutional law professor, law reformer, and human rights activist Teng Biao, who, as he writes here, was banned from teaching three times in the years 2009, 2011, and 2012, but only officially fired in 2014, like so many other scholars, after Xi Jinping attained power. And, as Teng’s experience illustrates, the loss of one’s job and freedom of expression is only one of the risks that dissident professors run. Arbitrary detention, including kidnapping, travel restraints, and even retaliation against one’s spouse and children, may well follow. Is it any wonder in these circumstances that the Times quotes one of Xu’s liberal intellectual supporters, Zhang Yihe, as saying: “Xu Zhangrun’s hardships aren’t unique to him. Caring about what happens to Xu Zhangrun is caring about ourselves.” But what can they do about it, and what can we do to help? I have been thinking about loss. Xi Jinping’s repeated refrain is one of “win-win” outcomes, yet behind his rhetoric are massive, and growing, losses. Most glaring are the losses borne by the as many as 1.5 million Uighurs and members of other ethnic minority groups that have been, or are currently being, held at internment facilities in Xinjiang. Even if these individuals are eventually released, they have suffered human rights abuses that can never be fully remedied. The toll on their families is also immense. The losses also include human rights advocates and lawyers who have been disappeared—as seen in the 2015 “709” crackdown—or silenced out of fear. Lawyer Jiang Tianyong completed his sentence last month for fallacious charges of inciting subversion only to land in what Jerry Cohen has termed “non-release ‘release’” in which he remains under tight state control. Now, the silencing of Professor Xu Zhangrun demonstrates the loss of scholarly voices. We owe a debt of gratitude to Geremie Barmé for his exquisite translations of Xu’s work. Barmé wrote of Xu’s July 2018 essay, “Xu has issued a challenge from the intellectual and cultural heart of China, or 文化中國, to the political heart of the Communist Party.” The Party heard the challenge and responded with a hammer. In a season of discontent and buffeted by winds from all directions, silence now reigns in our realm. . . [A]s for my part, as a lowly pedagogue, and as Mr Hu Shi remarked over eighty years ago: ‘And teachers, then? They just do their thing!’ [that is, teachers speak out, and they’ll just keep on doing so]. But when speaking out one must make oneself heard, for only then can there be some kind of dialogue or exchange. Only then can we break free of the solitude of self and enjoy the realities of community, and thereby affirm our humanity. While it is true that the cashiering of Xu Zhangrun is a grievous assault on the principles of an open society and bespeaks the very unwelcome trend in China towards a more repressive and retrograde form of authoritarianism, its meaning and consequences are far wider. Censoring such an eloquent and elegant voice represents another discouraging step in China’s steady descent into a later-day form of intolerant, Maoist, big leader kultur that serves as an inescapable reminder that what divides the U.S. and China—indeed, what separates China from the whole liberal democratic world—are not just a few trade and investment disagreements, conflicts over far-flung islands, or instances of intellectual property theft, but starkly opposing systems of values and governance. In the end, what makes the attack against Professor Xu so important to us as Americans, and especially to U.S. policymakers, is not simply that it represents the unjust political persecution of another fellow human being, but that it underscores the far more antagonistic state of contradiction in which the whole U.S.-China relationship must now try to find a new equilibrium. Chairman Mao always prided himself on acumen as an original Marxist-Leninist theorist, and one of his most useful contributions was his analysis of two very different kinds of “contradictions” (maodun, 矛盾) in the world. There were “contradictions among the people” (renmen zhinei maodun, 人们之内矛盾) that could be resolved through debate and discussion. Then there were also “antagonistic contradictions” (diwomaodun, 敌我矛盾) that could only be resolved through struggle and conflict. Our mutually accepted policy of “engagement” depended on China’s commitment to reform as a solvent that allowed both sides to believe that what divided the U.S. and China was largely resolvable in a non-antagonistic way. As long as the U.S. only confronted a “contradiction among the people,” figuratively speaking, in its relations with China, we could imagine ourselves on slowly converging pathways, and engagement made sense. But Xi Jinping’s recent turn to proto-fascism has changed that equation, so now as we look into the future it’s hard to see anything but a more adversarial relationship.